History buffs and those who have a keen eye for beauty will be equally impressed by the Tuscan revival prints up for sale at FastFramePrints.com. This movement in Italian art was immensely popular in the 19th century and since art transcends time, the paintings are just as fashionable today. When decorating a room with such artwork, people add a touch of style to the interior, without going over the top and looking pretentious. 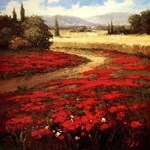 FastFramePrints.com has assembled a collection of Tuscan revival paintings, including some of the masterpieces authored by famous Italian painters. Just as the name suggests, the thing they have in common is the passion for the beautiful Tuscany countryside. The rolling hills, covered in blooming flowers and the seemingly endless vineyards serve as a source of inspiration for the artists and the result is a staggering assortment of Tuscan revival posters.